Not much happens in Rioja in August. Winery workers are on vacation except for a few people in the biggest companies in case of an emergency. Most small and medium-sized properties close for the month. I stop writing to concentrate on my golf game. The only things happening are the steady ripening of the grapes and my lack of improvement at golf. According to reports from the Rioja Regulatory Council and ASAJA (the young farmers’ association), the probable size of the 2016 harvest will be between 430.000 and 450.000 metric tons, which is roughly equivalent to 430-450 million 75 cl. bottles. These sources agree that this will cover existing demand. Included in the projected harvest are just over 1000 hectares (2470 acres) of red grapes planted in 2014 and 1200 new hectares (about 3000 acres) of white grapes. While it’s too early to make a prediction about the quality of the harvest, so far, so good, although the vines are stressed due to lack of rain in August. This list says a lot about the current state of rioja. First, many of the brands describe specific places or single vineyards, even though this designation isn’t officially recognized yet. Reality, as usual, is moving ahead of the rulebook. The increased presence of whites stands out, and surprisingly the top scoring wine for Gutiérrez was the very traditonally made Castillo Ygay white gran reserva 1986. In a separate interview in LA RIOJA, winery owner Vicente Cebrián explained that this wine spent 21 years in barrel, six years in a cement tank and was bottled in January 2014. It will be presented in a series of tastings in the USA starting in New York on October 21. 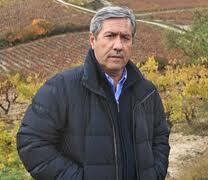 Cebrián says that the wine will be sold at 700 dollars a bottle. Why not? Not surprisingly, other traditional rioja whites such as Viña Tondonia and Viña Gravonia made Gutiérrez’s list. In fact, as I observed during a recent tour around our region with a group of Rioja Educators, other wineries like Bodegas Ontañón and Barón de Ley are trying to replicate this style of long ageing in older barrels to capitalize on demand, especially in the US market. While these traditional whites have found a niche at the mid-and high end of the market, we need to develop whites to compete at more competitive price points because young viura by itself simply doesn’t have the intense aromatic profile demanded by consumers today. Gutiérrez recognizes that rioja is moving in the right direction with blends of viura and recently approved varieties. Consolidating these new styles of rioja white will take time however as Rias Baixas and Rueda are strongly entrenched in markets. Conscious of this, the Rioja Council is launching a PR campaign to promote white. Another development that could be construed as either good or bad news is that following intense discussions in the Council, the ‘single estate’ concept has been renamed ‘viñedos singulares’ (singular vineyards). This is probably to reflect the fact that “any old” single estate shouldn’t be considered prestigious a priori. Experts in viticulture and rioja’s most prestigious producers are formulating criteria to determine what makes a singular vineyard. The Council says it will decide in November, although it might take longer than expected as prestigious single estate producers will want to assure that their own vineyards are included and there will undoubtedly be pushback from prestigious producers of blended rioja to level the playing field. The not-so-good news centers around 42 wineries from ABRA (the Rioja Alavesa Winery Association that represents most of the small wineries in the Alavesa sub-region) petitioning the Basque government to approve a new designation called ‘Viñedos de Álava separate from rioja. What have local pundits called this movement? You guessed it: ‘Riexit’. The official reason is that the Rioja Regulatory Council hasn’t done enough to recognize the specificity of wines from the Alavesa. It is most certainly politically motivated, however, as the Basque government has historically demanded a greater control over Alavesa wines. The director of the Council said earlier this week that his wish was to keep regional politics out of the rioja wine business and to discuss Alavesa claims inside the Council. Currently the Council is studying a labeling rules change to allow the term ‘Rioja Alavesa’ to be the same size as ‘Rioja’. Will this be enough? I hope so. It would be suicidal for 42 relatively unknown wineries to go it alone or under a new umbrella brand in today’s ultracompetitive wine market. If you have allergies like me, June is the worst month to taste wine. It’s a lose-lose situation. If I take my allergy medicine I can’t drink or drive. If I don’t, I spend the whole day sneezing, my nose is plugged up and I can’t taste a thing. It also makes me really ornery! So it was fortunate that it rained yesterday and today, clearing the air of pollen, allowing me to skip my pill and taste some wine. I usually buy my wine at local wine shops rather than supermarkets because the releases from small wineries are only available there and in restaurants. I bought today’s bottle from Miguel Reinares at La Viñería but often buy at Universal de Vinos, owned by Juan Carlos Somalo, with whom I’ve shared lots of bottles. These two shops are the places to go to discover new wines in Logroño. 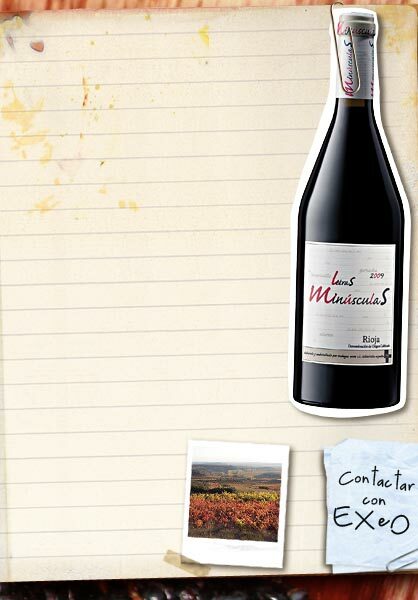 Today for lunch I opened a bottle of ‘Letras Minúsculas’ (Small Letters) 2009 from Bodegas Exeo in Labastida. The wine is made from tempranillo (75%) and garnacha (25%) from the winery’s vineyards located around Labastida in Rioja Alavesa.. According to the back label the wine had been aged for five months in ‘mixed’ (ie from different origins) oakbefore release. The wine blew me away. It was soft, fresh and smooth, with red berry flavors and just a hint of oak, perfect for sipping or just about any kind of food. It was a magnificent statement about the potential of garnacha-based wines in Rioja Alavesa. I wish more wineries would take a chance with garnacha, once the dominant red grape in Rioja but now sadly relegated to a distant second place behind the ubiquitous tempranillo. Garnacha sometimes has problems with fruit set but when the conditions are right can make stunning wines in Rioja. I checked out the website and learned that Exeo’s wines are distributed in Spain, Holland, Australia, the USA (Washington DC, Maryland and Virginia) and Puerto Rico. The recent ruling by an Argentine judge affirming that wines from the Argentine province of La Rioja don’t cause confusion with Spanish Rioja reminded me that even here in Spain, the use of ‘Rioja’ can be confusing. First of all a short Spanish lesson: ‘el’ and ‘la’ are the masculine and feminine singular definite articles in Spanish. Both mean ‘the’ in English. ‘El Rioja’ means ‘Rioja wine’ as does ‘el vino de Rioja’, while ‘La Rioja’ is one of Spain’s 17 autonomous regions, comparable to ‘states’ in the USA or ‘länder’ in Germany. ‘Rioja’ without the article refers to the Rioja denomination of origin (denominación de origen calificada Rioja), or Rioja wine region. The D.O. Ca. Rioja is located in three of Spain’s states: La Rioja(68,2% of the total area), Álava in the Basque Country (21,1%) and Navarra (10,7%). This fact has a number of consequences for Rioja wine. First, it means that ‘el Rioja’s’ wine rules have to be approved by the Spanish ministry of agriculture, while for practically all of Spain’s DOs, located within one region, the regional government has the power. There are only three exceptions: Rioja, Cava and Jumilla. Three states, three governments and therefore three groups of elected officials, from three different political parties, are represented in the Rioja Regulatory Council, the organization made up of farmers and wineries, where the development of Rioja grapes and wines is debated. So politics often interferes with the running of the wine district. In addition, several organizations vie to promote Rioja wines: three Chambers of Commerce, regional and city government promotion boards, ICEX (the Spanish Institute of Foreign Trade) and the Rioja Regulatory Council itself. I once counted 17 of them. It would be great if these organizations put their money into a common pot. However, with the exception of the Regulatory Council and ICEX, for whom ‘El Rioja’ is a whole, each of these local and regional organizations promote ‘their’ Rioja, which means that promotion, PR and advertising often resembles shoppers fighting over a piece of clothing at a fire sale. Distributors, wine writers and journalists are often bewildered by the conflicting messages they hear. I remember talking to a Dutch journalist several years ago about attending a series of wine tastings in Logroño called ‘Grandes de La Rioja’, organized by the government of La Rioja. He asked me whether he would be able to taste the Riojas produced in the other two regions. ‘Sadly, no’, I replied. The Rioja Regulatory Council has jumped through a lot of hoops to get everyone in the boat to row in the same direction and promote Rioja wines in general, with some success. For several years, elected officials from the three ‘states’ have provided a small amount of money for promotion, but it’s peanuts compared to the funds they devote to ‘their’ Rioja. It’s ironic that the growers and wineries themselves don’t feel as attached to their subzone as their elected officials. Many farmers sell their grapes to wineries in other parts of the region, wineries do the same with bulk wine and some companies located in one part of Rioja have vineyards and even wineries in more than one subzone. They recognize that the strength of the word RIOJA transcends these regional differences. From the air, Rioja is an extremely complex checkerboard of small vineyards. The 64.000 hectares protected by the Denominación de Origen Calificada Rioja are divided into about 120,000 individual vineyards farmed by 19,000 growers. A farmer’s holdings are often separated by hundreds of yards, making efficient vineyard management difficult. The agricultural departments of La Rioja, Álava and Navarra are conscious of this problem and have promoted the idea of vineyard concentration. This means throwing the current vineyard property division in villages out the window and making a new one so that all individual farmer’s lands in a specific village are contiguous. You can imagine that concentration is an extremely complex process, because farmers are usually reticent about giving up a plot they know well to taking ownership of another plot, even if it’s next to one they already own. Farmers fight tooth and nail about this and I’ve heard that the process often takes ten years or more. Fernando Remírez de Ganuza got his start in the wine business by buying, consolidating and selling vineyards. This intimate knowledge of Rioja vineyards was a great help to Ramírez when he began to make wine in Samaniego, in Rioja Alavesa in 1989. Fernando Remírez has made a name for himself in Rioja not only for the excellent reputation his wines have earned in a short time but also because of the innovative winemaking processes he has pioneered. The first of these is recognizing that there is a difference in structure between the grapes in the ‘shoulders’ of each bunch and those in the ‘tips’. To picture this, imagine a grape cluster as an upside-down isoceles triangle. At Remírez de Ganuza, the ‘shoulders’, rich in pigmentation, are used to make reservas and are consequently destemmed before fermentation. The ‘tips’, with less color, are used to make carbonic maceration reds and are not destemmed. The separation process takes place on the sorting table. A second important process is using the skins of the white grapes to ‘fix’ the color of reserva wines during fermentation. In Rioja, it’s legal to blend red and white grapes (not red and white wine, however) and traditionally, winemakers have added some viura to tempranillo before fermentation to increase the acidity of the finished wine. The idea of adding the skins of white grapes to a fermenting tank of red grapes was new to me, however. It works, too, as all the Remírez de Ganuza wines show a lively, zingy acidity that is a hallmark of good Rioja. For Trasnocho, the top of his range, Remírez uses a heavy plastic bag that is inserted into the fermentation tank. This bag is then filled with water to displace the air in the tank, gently crushing the grapes underneath and preventing the oxidation of the tannins. We tasted the Remírez de Ganuza range at a recent winemaker’s dinner in Logroño. Fernando commented first that all the wines were made from grapes from the same vineyard in Samaniego. This was surprising because we expected the different wines to come from different vineyards. Erre Punto white 2009. 70% viura, 30% malvasía. Pale yellow. Floral and citrusy on the nose. Well balanced fruit with a medium mouthfeel and long aftertaste. Fernando Remírez commented that the structure of the wine comes from macerating the skins in the juice for a short time before fermentation. Erre Punto red 2010. Carbonic maceration. 90% tempranillo, 5% graciano, 5% viura and malvasía. Intense ruby. The nose reminded me of spicy chewing gum (Dentine). Floral, firm structure on the palate, with good acidity considering that it was a carbonic maceration wine. Remírez de Ganuza reserva 2005. 90% tempranillo, 10% graciano. Black cherry. Toasty, dark fruit and cocoa. High acidity, ripe fruit and tannins. A little closed. Ready to drink now but can be cellared. After five minutes the wine opened up, with an aroma reminiscent of cranberries. Trasnocho 2006. 90% tempranillo, 5% graciano, 5% viura and malvasía (skin only). Very intense black cherry. Closed nose but after swirling the wine in the glass it opened up to reveal somewhat acidic fruit, reminding me again of cranberries. On the palate, ripe tannins, and crisp acidity, typical of a good Rioja. Ever the innovator, Fernando Remírez told us that he is going to experiment with the new white varieties recently approved by the Rioja Regulatory Council, although he is a firm believer in the renaissance of traditional white Rioja varieties. In our family we celebrate birthdays and saint’s days. I was introduced to this Spanish custom by my father-in-law Antonio, who used to invite his family for a drink before lunch on San Antón, (St. Anthony Abbot), January 17. 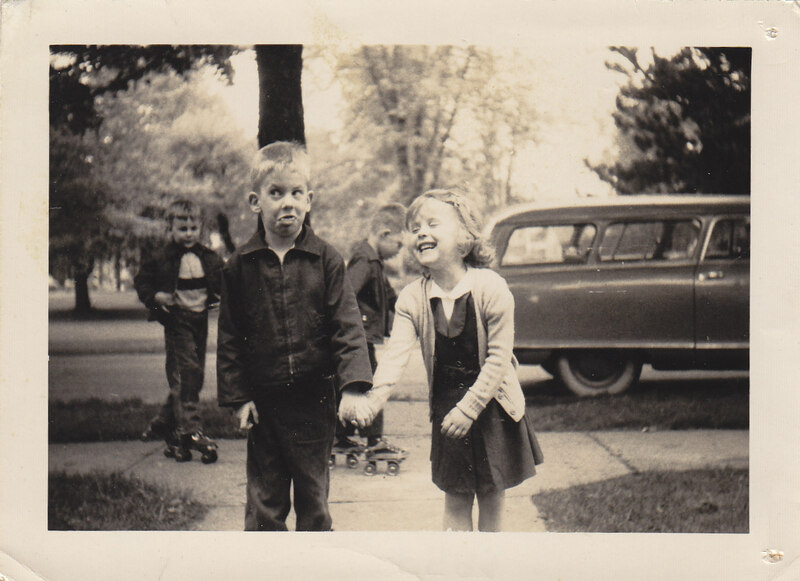 We decided when our kids were growing up that we would treat them and ourselves by going out to dinner whenever one of our saint’s day fell. Last week, January 28 was St. Thomas Aquinas, so it was my turn. The rules in our family are that you can choose where you want to go and can order whatever you want, so I decided we would go to the Iruña, a small restaurant on calle Laurel in the old part of Logroño. We like it because it’s cozy, usually packed, often with people we know (after all, Logroño is a pretty small place) and the food and wine list are terrific. I decided I was going to order a steak, and as I looked over the wine list, saw Amaren reserva 2001 by Bodegas Luis Cañas and decided it was a perfect match. I had taken lots of wine writers to the winery over the years and knew the winery and wines very well. Bodegas Luis Cañas was founded in 1928 but the Cañas family had already been growing grapes for over one hundred years around Villabuena in Rioja Alavesa. The family winery started as a cosechero, but gradually started buying barrels for aging the wines. Today, the company owns 90 hectares of vineyards and buys grapes year after year from farmers controlling another 200 hectares, all in Rioja Alavesa. Their grape selection process is the most elaborate of any winery I’ve ever seen. The winery keeps records of the 815 vineyards that supply grapes, with each one classified by age and varieties planted, so the winery knows which grapes are likely to be used for each wine. Each cluster of grapes is placed on a selection table where unripe or damaged clusters and leaves are removed, after which they go to a second table where each individual grape is examined. The grapes are vinified in batches according to quality. Amaren (‘for mother’ in Basque) is a homage to Juan Luis’ mother and one of the winery’s top brands. The back label indicated that it’s 100% tempranillo from vineyards over 60 years old, aged for 18 months in French oak. Palate: ripe, elegant fruit with good acidity, a medium mouthfeel and a very long finish. A modern Rioja showing a lot of fruit but with the tannin and acidity to give it long life. After ten years it showed perfectly. We shared a plate of artichoke hearts with small pieces of ham smothered in a slightly thickened sauce from the artichokes, and a big steak brought sliced and almost raw to the table on a sizzling hot clay plate, where we cooked each piece to our individual taste, with French fries and slivers of roast red peppers on the side. A lot of people say that you should never mix artichokes and wine because the artichokes give the wine a metallic taste, but I’ve never found this to be the case the way they’re cooked in Rioja.